Gameweek 14 is barely over but the Gameweek 15 will soon be upon us. Here’s the Form v Fixture Charts. Liverpool are out in front for Gameweek 15, closely followed by Chelsea. Their current form, combined with a good run of fixtures mean that they are better investment than Manchester City. 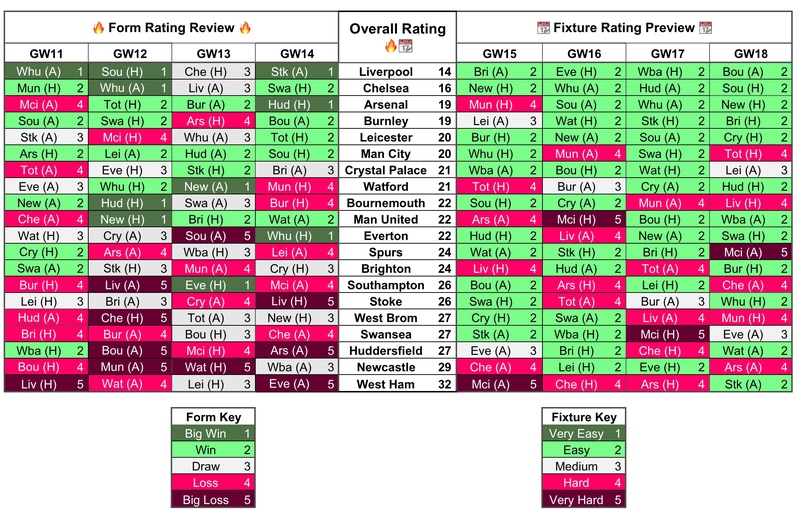 There’s obvious rotation concern for Liverpool, but Mo Salah should be safe now that he’s had a rest in Gameweek 14. Coutinho and Mane are also good options for attacking returns, there’s a tough UCL game plus the Merseyside Derby in the coming weeks though. Chelsea warrant investment across the field since their good run of fixtures stretches even further beyond those displayed. Hazard was another rested in midweek, so is primed for a run of games. If you have the cash, I’d look to get in Morata too but be aware that Conte could bench him and start Willian, Hazard or Pedro as a false 9. In defence, Christensen seems to have earnt his place. Azpilicueta shouldn’t be rotated again in the coming weeks and he has a good partnership with Morata. Alonso always is a threat on the left wing and from set pieces but he does have the tendency to be subbed before the 60 minute mark. Manchester City are unbeaten this season, but aren’t top of the list for Gameweek 15. Manchester United and Arsenal have won their last 3. The City defensive line is settled with Stones out injured so I’d encourage investment here. There’s certainly going to be goals from this Pep side but the rotation will be worse than ever in the coming weeks and the two tricky games are likely to be tight 1-0 wins. In all honesty, I’d look elsewhere to Chelsea and Liverpool. Arsenal are on a decent run of clean sheets, investment in any of their back line should be encouraged – Mustafi is the cheaper option here. In attack, Ramsey is always chipping in with assists and Sanchez is always a threat from set pieces and looks set to explode at any moment. From Manchester United, it’s surely time to ditch Lukaku. I’d definitely be hanging on to David De Gea though and Paul Pogba looks like the pick of the attacking players as he gets consistent starts. Leicester, Crystal Palace and Burnley have the best run of fixtures. None of these teams are involved in European games and Leicester are the only side still in the EFL Cup, so rotation looks less likely. Leicester have got four easy games, with potential at both ends of the pitch. 2015/16 starlets Riyad Mahrez and Jamie Vardy are both in form, they should also be less affected by rotation than the top sides. Schmeichel and Maguire are strong candidates for BPS when clean sheets are kept, but Simpson and Morgan are the cheaper options for investment. The argument for a double Burnley defence prevails, with Nick Pope and Ben Mee the best value options in the backline. Robbie Brady has got a few assists in recent weeks but attacking forces are unlikely to be prolific. For Palace, Sakho is always a threat from set pieces and Hennessey has won his place back as the first choice keeper. Zaha and Loftus-Cheek are most likely to be involved in the goals, they’re good value for money over the next 4. While you’re here, have a look at the 10 Community Highlights for Gameweek 15 bringing together the best bits ready for the upcoming Gameweek.